With Coachella kicking off this weekend it is officially festival season! The pressure to look picture perfect while also weathering music festival conditions can be stressful. But as long as you have all your essentials in a clear back pack and right there when you need to freshen up, you’re all good to go! 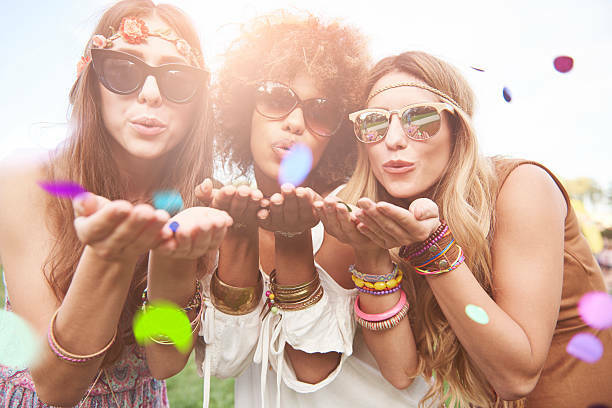 So I’ve created this quick and easy festival fashion and beauty trends guide anyone can follow and accomplish! Get ready for your Instagram to be poppin! 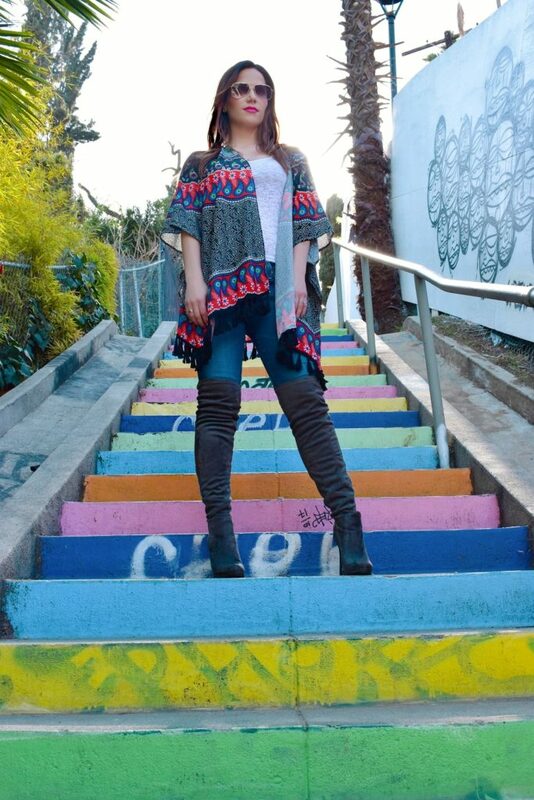 You can’t go wrong with a kimono. You can honestly rock a kimono with anything from your sexiest bikini to jeans and a tank top and you will look amazing. For some added festival flair wear a kimono with fringe or tassels like this one I wearing from Shein for only $14. Here are some other kimono options I adore at super affordable prices! Let’s be real, music festivals are packed with people, usually in the middle of nowhere and go all day and all night. These are not ideal conditions for photo-friendly hair, but with the right hair accessories, you can keep those locks in check. I’m a big fan of flower crowns and flower clips that add color and fun to pulled back hair and braids. Music festivals are the place to let your inner unicorn shine! More is more when it comes to colorful makeup, so pile on the glitter, colorful eye makeup, shiny lip gloss, strobing balm and more! Here’s a fiery look I put together using Christian Louboutin Les Yeux Noirs mascara, Maybelline New York Master Precise Ink Metallic Liquid Liner in Solar Gold, Winky Lux strobing balm and Urban Decay Hi-Fi Shine Ultra Cushion Lipgloss in Goldmine and Bang. Speaking of Unicorns, have you heard of holographic hair? 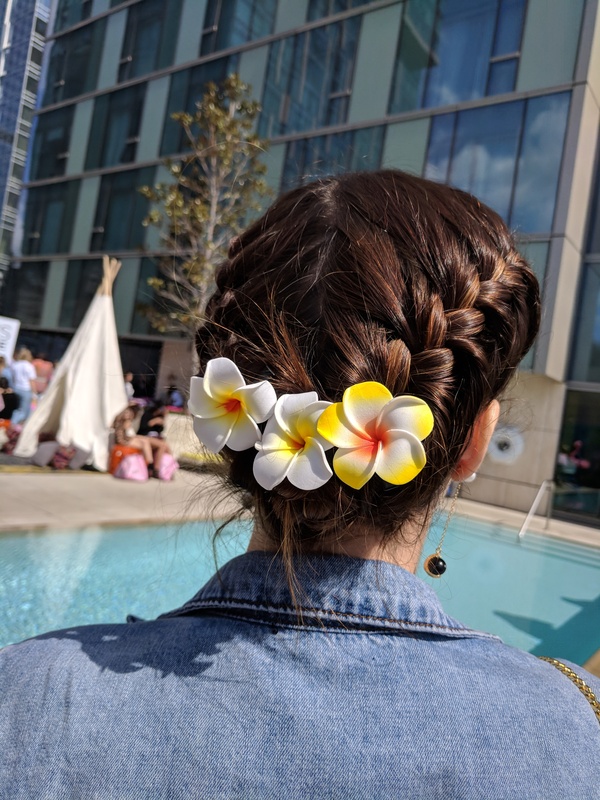 I recently attended ipsy Gen Beauty a live celebration of unique beauty and self-expression, and left with so much inspiration from my fellow beauty lovers, top creators, and beauty brands. One of my favorite discoveries was IGK’s Foamo Holographic Hair Foam, a shade-shifting, holographic glitter hair foam that shifts colors as your hair moves in the light. Currently, the foam comes in two colors, it looks killer during the day and night and is super easy to apply. And for my fellow beauty lovers be sure to check out when ipsy Gen Beauty is coming your way. This is such a fun weekend and you will leave with beauty products galore! Keep in mind that at most festivals, especially those in the desert like Coachella, once the sun goes down it can get chilly fast. A denim jacket is a great way to stay warm and still look cute. I just got this long denim boyfriend jacket from STS Blue and I love it! It looks super cute with dresses and shorts, so it is very festival friendly. Another festival essential to break out, your shortest shorts. Yes girl, I know you love those daisy dukes and music festivals are THE place to rock them. Hey, you’ve been hitting the gym hard so own it! Here I am workin my Wrangler x Peter Max High Rise Contrast Panel Denim Short. Nothing is more effortless and comfortable than a maxi dress. Luckily, maxi dresses are perfect for festival season! I was recently introduced to the brand Showpo and am obsessed with their sweet relief maxi dress in beige embroidery. This has festival babe written all over it! When you are at a festival you are out pretty much all day and all night, so chances are you want to bring a good amount of stuff with you. I personally always have sunscreen, protein bars, blotting paper, a jacket and more, so I like to bring a cute backpack or fanny pack. 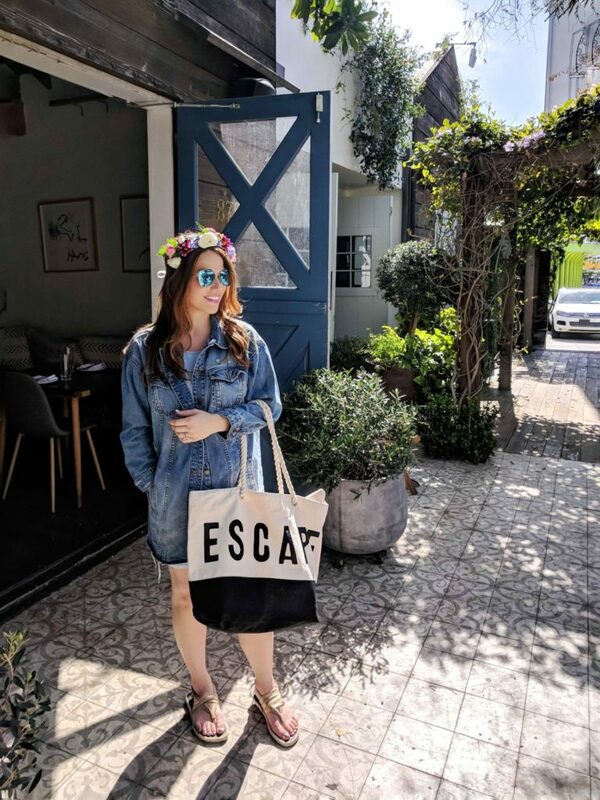 I recently discovered Eastpak’s latest release of cute prints and think they are perfect for festival season. I bet you agree! You can absolutely pile on the jewelry during festival season, once again more is more! So stack those bracelets and necklaces and wear your most expressive earrings! I’ll be wearing my star and moon asymmetrical earrings from Happiness Boutique. I love that each earring is different but goes together, plus they are just $30.65. Finally, a sunburn is never stylish, so keep your skin protected. I know it is hard to reapply once you have makeup on, so use Coola’s Makeup Setting Spray with SPF 30. It will keep your makeup looking fresh and protect your face from those intense daytime rays! I hope you’ve enjoyed my quick and easy festival fashion and beauty trends guide. Here’s to the best festival season yet! Stay safe and have fun everybody!! You might also enjoy my summer travel must-haves. This is such an awesome guide. It’s perfect! What a fun post!! You really nailed it with all your featured trends. I love!